For as long as I can remember, people have been looking for the magic food that can either improve their workout performance, help them lose weight, give them clear skin, or in the best case scenario, all of the above. Oh and it has to be inexpensive too. Well, what if I told you the search is over. What is this magical thing I speak of? It’s water! Although it may not be a cure-all, it’s pretty close with all of its great benefits (and fits into the college student’s budget because it’s free). Water is important to our bodies and here’s why. 1. Weight loss: Substituting sweetened beverages with water is a simple way to reduce the amount of empty calories in a person’s diet. Drinking water also helps you feel fuller, which prevents overeating. 2. Feeling energized: Dehydration will result in feeling sluggish and tired. Combat this by drinking water to wake yourself up! 3. Enhancing performance: During exercise you lose water primarily through sweat. 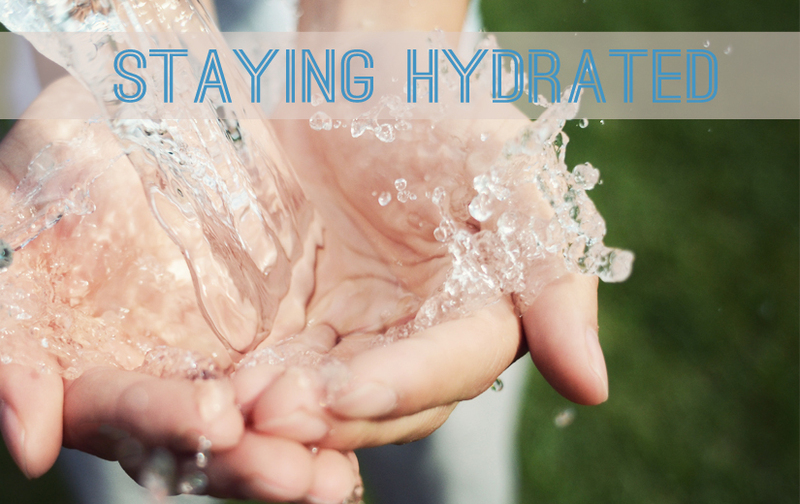 Drink adequate amounts of water can prevent dizziness, muscle cramps, and fatigue. 4. Gastrointestinal health: Water helps food flow through the intestine and can help alleviate constipation. It is recommended for a total daily beverage intake of 13 cups for men and 9 cups for women. Keep in mind that there’s no exact formula so the amount you need changes depending on exercise, temperature, and food intake. You also don’t need to drink this full amount of water because a lot of foods contain a high percentage of water. Broccoli is 89% water and it is loaded with B vitamin, vitamin A, vitamin C, potassium, calcium, and lots of fiber to help you feel full. Crisp lettuce is 96% water and a great source of potassium and folate. With the temperatures rising, a hearty salad will not only be tasty but refreshing as well. Watermelon is 91% water and a great source of vitamin A, vitamin C, and lycopene, which has been shown to prevent cancer. Low fat milk is 89% water and is high in vitamin D, phosphorus, potassium, and it can add protein to your diet. Grab some low fat chocolate milk as an easy post- workout treat. Apples are 84% water and is high in fiber, vitamin C, phosphorus, calcium, among many other vitamins and minerals. It’s a portable snack that you can throw in your backpack and enjoy while you’re on the go. Also, you can sip water throughout the day by bringing a reusable water bottle with you wherever you go! You can conveniently fill it up at any hydration stations located on campus. Now that you know the secret about water, share it with those around you!